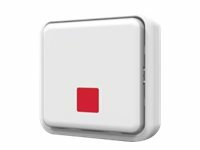 AXIS T8343 Alert Button is a push button which relays events such as notification messages, illumination, and much more. By communicating wirelessly with AXIS M5065 PTZ Network Camera or connected Z-Wave Plus controllers, the alert button can be used in small security solutions with less cabling. The wireless I/O connectivity also enables flexible installation as the relay can easily be moved and adapted to your needs.